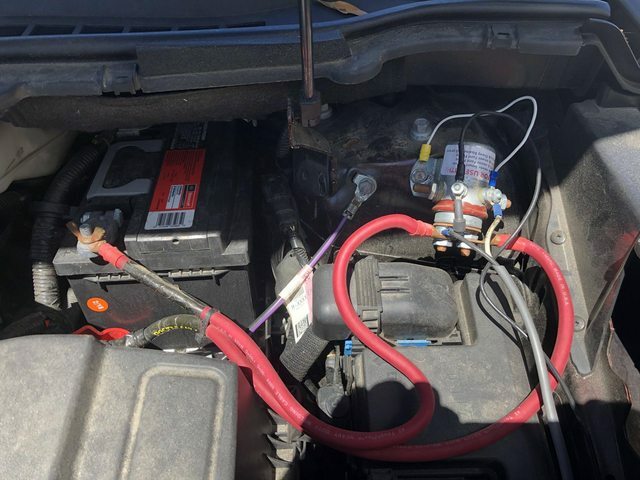 If you installed a battery disconnect on a 2016 Ford Edge or similar, could you please tell me where you located yours? Hopefully you can provide a picture. I have a battery disconnect on my 2016 Edge Sport. It is wired so that the battery is disconnected as soon as I plug in the 7-pin cable from the motorhome. The disconnect relay came from Roadmaster. Per your request. We tow a 3.5L 2017 Ford Edge SEL with our ‘17 Canyon Star. We drove the Edge directly from the Ford dealership to Golden Gait Trailer, Concord, NC for the total install. To date it tows great, no issues, everything works as designed. Safe travels. FWIW If you remove the spacer in front of the battery you can slide it forward about two inches and get to the neg post. I installed a 12 -16 inch jumper on the battery and the other end to a rotary switch and put stock connector on other side of the switch. Slide battery back and put spacer in. Switch is marine rated battery cut off switch. I use a jump and carry battery box to power my RVI2 brakes. Edge is pleasure to tow and have around camp. Set up rig before toad. When leaving, toad first then rig. Question - I have a keyless ignition...I am struggling with how to power the Blue-ox brake unit if I disconnect the battery. Instructions are to put in N and then press the button to turn off. Wondering if I have 12V power the accessory in the console if the switch is off? I know if I disconnect I won't but then how long will the battery last when run like this? If I understand your question, it is similar to ours on the 17 Ford Fiesta. What we did was run an inexpensive "cigarette" lighter plug to the drivers feet area. The negative from that ran to the negative on the battery, the positive ran to the positive side of the battery disconnect switch in post 3 or 4. What this does is allow the new plug to power the brake system while the rest of the car has no power. We wondered about draining the car battery but so far, after a few trips of no more than 7 hours, the toad starts immediately. I hope this helps. I'd attach pics but the wife has the car at work. Feel free to PM with any questions. In a conversation with Roadmaster, the tech told me that you should disconnect the positive, not negative. The logic is that the toad is connected to the RV via a metal hitch etc. and that the car systems that have power via the positive side will be "searching" for a ground and will find one through the RV. He said this may not be good for some components in the car. What BS. A complete circuit is required for any current to flow. Disconnecting either the positive or the negative post will completely disconnect the battery. The reason for disconnecting the negative post first is for your safety. It you happen to touch your wrench to a metal part while disconnecting from the negative battery post, nothing wiil happen. However, if you don't disconnect the negative and touch a metal part with your wrench while it's on the positive post, you're effectively shorting the battery. Resulting in big sparks possibly welding the wrench to what it's touching or exploding the battery. i found it contrary to disconnect the battery on our 2012 edge. especially since it states to leave the system in the accessory mode, which powers up a few items, but the battery saver programing will turn that off after 10 minutes. so i made a charge line from the 7 to 6 pin cable from the bus. it feeds through a 10 amp fuse to keep battery up while towing, and the battery saver programing detects a charge input and keeps the accessory mode turned on. this way the patriot brake still has juice and nothing gets run down. The reason for leaving your car with the key in accessory is to unlock the steering wheel. not on my car. the wheel is not lockable. we have the push button start. the book says to leave it in accessory mode . when you do this the dash indicates you are in FACT in N.
it sleeps after a few minutes but comes back to life if you open a door. Regardless, I am going to install a manual battery disconnect switch on the positive side similar to post #3. No wrenches used so no chance of shorting.